It’s that lovely time of the year again. 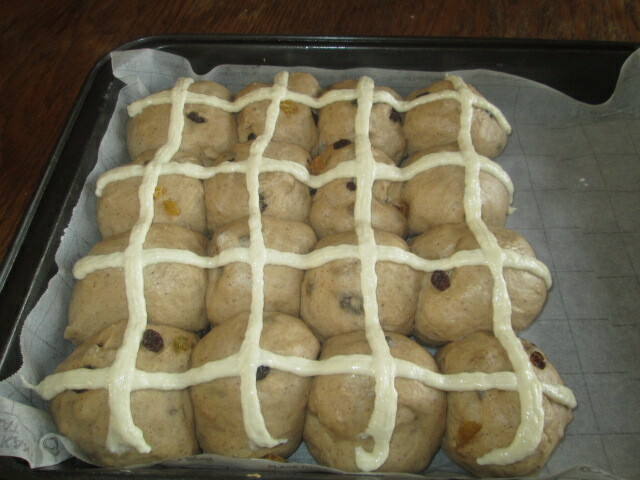 Growing up Catholic I have issues with eating Hot Cross Buns all year round, and if I did the novelty would wear off. When I got my bread machine I discovered that shop bought Hot Cross Buns are not a patch on home made ones and they really are easy. I searched for lots of recipes and after taking from a few and tweaking this is the recipe which I came up with and the whole family loves. Oooh and the smell when they are baking, yum, yum, yum. Place the following in bread machine pan in the order written. I guess it would be best to sieve the dry ingredients together and add combined after the sugar. At the end of the dough cycle, knead lightly and divide into 16 balls, place close together in a greased pan, cover and leave to rise in a warm place for about 30 mins. Combine ingredients for crosses and pipe on. Bake at 200 deg. C for about 20 mins until golden. Combine glaze ingredients and heat in microwave for 1 min. Brush over hot buns. Ag I need a bread machine. I adore hot cross buns but honestly yes, not all year round. A bread machine is a really worthwhile investment, I have the mellarware Ma Baker, not too expensive from PnP Hyper and so useful. Not only is our bread preservative free but it comes with us on self catering holidays, is used for Pizza dough and so much more. I need a bread maker. Have been wondering on how worthwhile it would be though. Seems to be a winner. 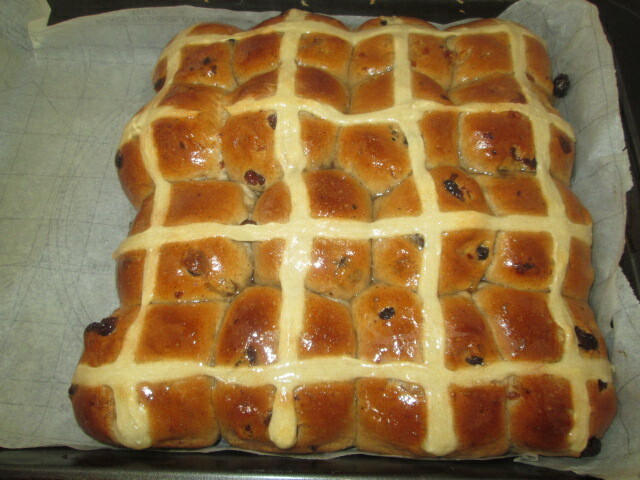 We dont really eat hot cross buns with raisins or sultanas. Can we substitute with choc chips and if so how many would you suggest? Hi Celeste, sure you can, I would probably go for about 1 cup choc chips. I love my bread machine use it for pizza dough, bread, foccacia etc.